“I tried watching a pro Overwatch tournament, but I couldn’t understand what was going on” is a refrain I’ve heard more times than I can count. I totally understand. Overwatch is a blur of lights, colors, and middle-aged men in cowboy costumes even in its chillest moments. 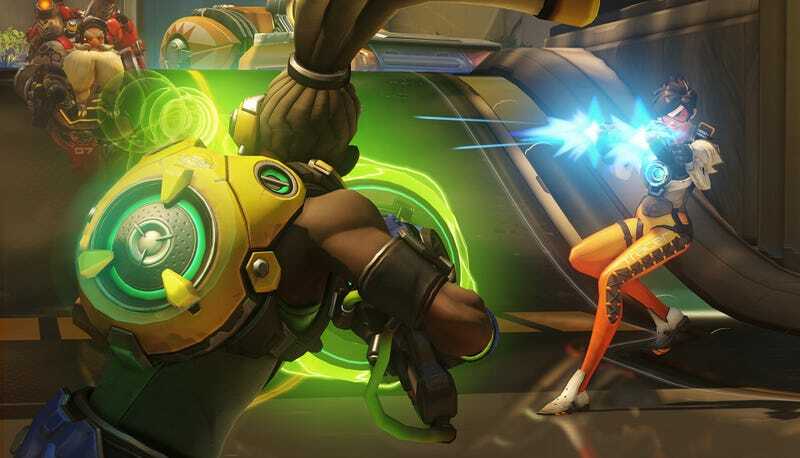 Ahead of Overwatch League’s big kick-off, Blizzard’s finally trying to make Overwatch more (over) watchable. In a new video update, Jeff “MLG Pro Strats” Kaplan announced a suite of esports tools that Blizzard will debut as part of the Overwatch World Cup at BlizzCon. The goal is to streamline the game’s interface so that viewers can effortlessly understand who’s winning and losing, rather than having to focus so hard that they look like one of those math lady memes. In-game team uniforms. Beginning at the World Cup, all teams will have uniforms in different colors depending on whether they’re the home or away team. Depending on who you’re watching, the HUD will match, as will visual effects and explosions. “We want to make it super obvious which player and team you’re watching at all times,” said Kaplan. A third-person “smart” camera. This is a third-person camera that knows where action is taking place and smooths it out so that it’s not all herky-jerky like when a person is moving it. “It knows where the action is at all times and is smartly following that action,” said Kaplan. Instant replay tools. Broadcasters will be able to select any moment from the killfeed, reposition the camera, time-scale it, and basically make it look really good and readable. In theory, this will make it much easier for commentators and analysts to break down plays. An automated tournament interface. This will allow tournament organizers to set up matches with little chance of human error. It also means that if a player disconnects mid-match, the game will auto-pause and hopefully, once they’ve reconnected, be able to resume right where the action left off. These features sound like exactly what the mad junk doctor ordered, but it remains to be seen whether or not it’ll all translate into a significantly more legible broadcast. I still contend that there’s a diamond of an esport buried somewhere in Overwatch’s mishmash of high-speed, mechanical technicality and character-driven strategizing, but as it stands, it’s caked in a whole, whole lot of rough.